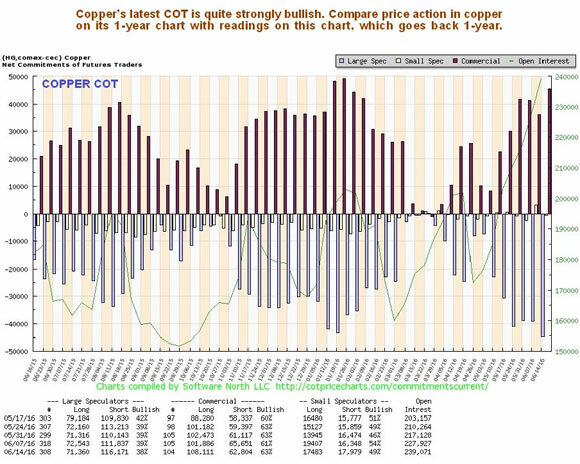 The chances of copper rallying soon are greatly magnified by its latest COTs, which show that the Commercials are now heavily long, while the normally wrong Large Specs are heavily short—this is the setup for a rally, and one reason for selecting a one-year time frame for the copper chart above is so that you can compare past peaks and troughs with the readings on the COT chart, which also goes back a year. 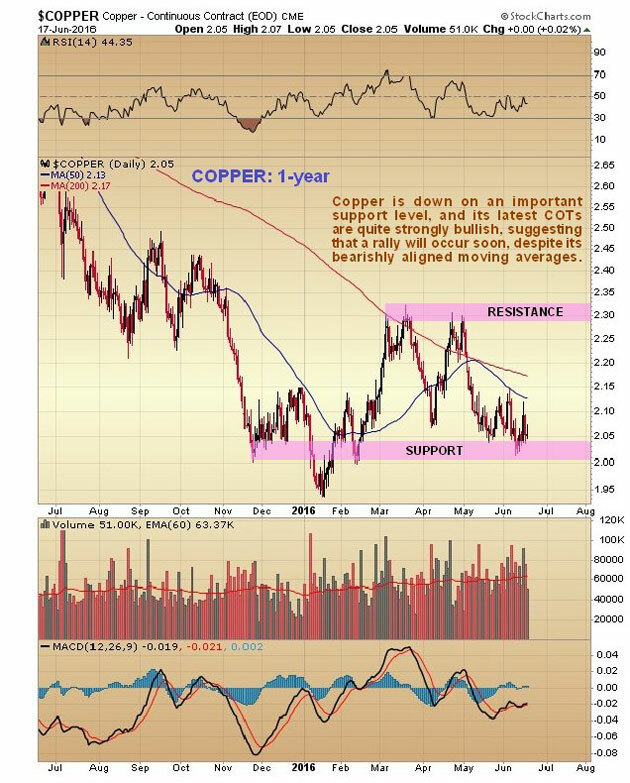 Since the price of copper is to a large extent determined by what goes on in China, which is by far its biggest market, this bullish copper setup prompts thoughts about the outlook for the Chinese market. The Chinese stock markets have had a really rough time over the past year, with an army of "get rich quick merchants" being put through the meat grinder after they generated a bubble rally. But if you have ever watched Chinese gamblers in a casino, you know that "they'll be back," as Arnie would say—they just love to gamble. While this fact in itself won't necessarily generate a rally, the Chinese stock market is showing increasing signs that it could defy current expectations and break to the upside. On the three-year chart for the Shanghai Composite, it looks at first glance like the market is set up for another downleg, after trundling sideways for most of this year. And it may yet, but with downside momentum easing after its earlier severe losses, and some bunching of price and moving averages, the chances of an upside breakout, although still not great, are starting to improve, and the now positive medium-term outlook for copper provides some circumstantial evidence that this might occur. Your attention is drawn to a couple of articles that I found interesting but you may not have seen. One is an article in ZeroHedge on The American Dream, and the other is an interesting article by David Stockman entitled Bubble News from the Nosebleed Section. I don't necessarily agree with Stockman, but this article is certainly a highly amusing read, as many of his articles are.